Watch out for Shiny Swinub on this Community Day with a twist. 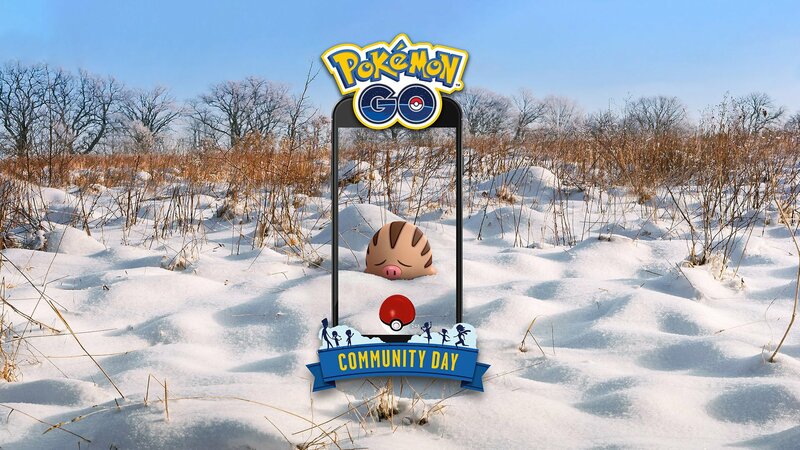 Pokemon Go’s February Community Day is coming February 16, with the starring Pokemon being the Ice- and Ground-type creature Swinub. From 2 p.m. ET to 5 p.m. ET on February 16, players will be able to encounter more Swinub in the wild than normal. Swinub is a Generation II Pokemon, which was first seen in the Pokemon Gold and Silver video games released on Game Boy Color in 2000 in North America. The pocket monster isn’t very rare in Pokemon Go, so at first glance, this Community Day seems rather disappointing. However, Swinub has two evolutions -- Piloswine and Mamoswine -- but only Piloswine is actually available in the game as of this writing. Mamoswine is a Generation IV Pokemon (first seen in Pokemon Diamond and Pearl on Nintendo DS), and it’s being added to the game as part of this Community Day event. To be specific, players will be about to use a Sinnoh Stone to evolve Piloswine into Mamoswine during the three-hour Community Day window, and for one hour following the event’s conclusion. Mamoswine evolved during this window will learn an exclusive battle move that has yet to be revealed. We don’t when or even if Mamoswine will be available again after this Community Day event, so make sure to mark your calendar if you want to catch ‘em all. As a refresher, Sinnoh Stones are new evolution items that were added to the game as part of the slow Gen IV creature rollout. As reported by GamesRadar, Sinnoh Stones can (normally) only be earned at random in two ways: by competing in Pokemon battles, and as a 7-day Field Research reward. To help players out, during February’s Community Day, players will have the chance to earn up to five free Sinnoh Stones by competing against other real players in multiplayer trainer battles during the event. In addition, users will be able to earn five rewards per day from trainer battles during the entire Community Day weekend, February 16 and 17. Here’s something to keep in mind: Since Community Day events have always given players a chance to capture a Shiny version of the featured Pokemon, if you’re the kind of player that wants one of every creature, you’ll need to collect at least two Sinnoh Stones in total -- one for the regular Mamoswine evolution, and the other to evolve Shiny Pilowswine into Shiny Mamoswine. Finally, as usual, other in-game bonuses will be active during Community Day. For February, players will earn three times the normal amount of Stardust as they capture Pokemon, and Lure Modules will last for three hours when activated during the event, rather than the standard 30 minutes. There’s a lot to take in here, so we recommend making this event a bit easier on yourself by trying to earn some Sinnoh Stones now (if you don’t already have some), so you won’t have to scramble during the event to earn the items you need.